We demand the best from the Fleet Feet Running Club (FFRC) staff so they can demand the best from you. They hold certifications from the Aerobic & Fitness Association of America, the American College of Sports Medicine, the American Council of Exercise, the International Sports Science Association, the National Academy of Speed and Explosion, the National Academy of Sports Medicine, the National Strength & Conditioning Association, USA Weightlifting, and more. They are well-versed in human movement, exercise technique, program design, and nutrition. They help you safely reach your current goals and then appropriately set - and safely attain - higher goals. And they are experts at holding you accountable. We proudly present them to you below (in alphabetical order). 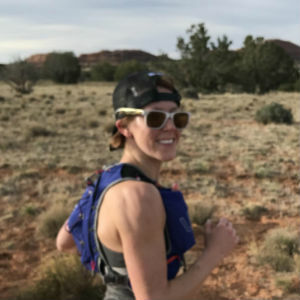 Running Club Manager Brandi Barbre has more than a decade of experience coaching athletic performance, prescribing corrective exercise, and conducting metabolic testing. She has trained thousands of post-collegiate runners over a variety of distances, hundreds of school-aged runners, and dozens of professional athletes (18 NHLers, 11 NFLers, 7 MLBers, and 4 MLSers). 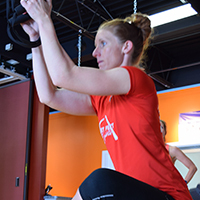 Brandi has a Masters in Exercise Science from Southeast Missouri State University, has earned ACSM CPT, NSCA CSCS, and USAW Sports Performance Coach certifications, and is a marathoner (28 fulls; 32 halfs) and triathlete (2 70.3s), herself. Mariana has a background in teaching group fitness since 2001. She is an American Council on Exercise certified Group Fitness Instructor and Personal Trainer. In 2004 that passion for group education moved into yoga and all the benefits that stretching and increased flexibility provides athletes. She is a Yoga Alliance of North America Certified RYT 200 Hour Yoga Instructor. She was a collegiate Volleyball and Water Polo player at Mount Holyoke College and post-college coached High School Volleyball in Minnesota. In addition to spending time at her lake house with her fur babies and husband, Mariana loves to meditate, travel, read, indoor cycle and make quilts. She is a transplant to St. Louis from Minnesota, moving here in 2012 for work and an opportunity to enjoy the “warm” Missouri winters. Since joining the Fleet Feet Team, Mariana has embraced the beginning stages of a love for running with training for short distance races. Barb Delgado has three loves: love of teaching, love of running, and the love of bringing the first two loves together. While a teacher (and coach) in the Fort Zumwalt School District, Barb received Teacher of the Year in 2005 and coached 3 State Champions and 16 All-State Athletes in Cross Country and Track and Field. Barb, herself, is a 7-time Boston Marathon Qualifier, the 2010 Little Rock Marathon Masters Champion, 3-time Quivering Quads Half Marathon Overall Female Winner, the 2013 Indiana Trail 50 Mile Overall Female Winner, the 2014 Berryman Trail Marathon Overall Female Winner (and former course record holder), and the 2015 Road Runners Club of America Regional Masters Half Marathon Champion. Hannah has a background in cheesemaking and fashion design, two paths that perfectly prepared her to think creatively and scientifically as an integrative bodyworker. As a distance runner, Hannah has always been interested in the human body, pushing it’s limits, and finding ways to help the body strengthen, recover, and find balance. Hannah’s range of massage experience includes prenatal, pre- and post-event sports massage, Ashiatsu, Thai, trigger point therapy and neuromuscular therapy. She loves working on athletes of all abilities and increasing body awareness in her clients. As a transplant from rural Wisconsin via Brooklyn, Boston, the north shore of Massachusetts, and most recently, Denver, Hannah loves travelling and exploring new places. When she’s not doing bodywork, you’ll find Hannah trail running, exploring St. Louis, cooking, painting, sewing, or otherwise creating. Andy Koziatek has a Masters Degree in Athletic Administration and Activities and is a USATF Level 1 certified coach. Andy's coaching resume includes stints at Marquette, Lindbergh, and Windsor high schools and William Woods University. During his tenures his high school athletes won a State Championship and multiple Conference, District, and Sectional Championships. At William Woods he worked with several Conference Champion teams, multiple All-Americans, and a National Champion. An elite runner, himself, Andy has marathon and half marathon PRs of 2:30:02 and 1:12:02, respectively. 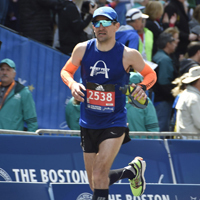 Andy is ideally suited to managing Fleet Feet's running and racing club and coaching Fleet Feet's trail running training program. Leslie Wolfe found a love for yoga in 2014 and discovered another love, running, in 2015. After running 3 half marathons in 2016, she realized how much yoga helped her throughout her training. With a Bachelor's and Master's in Education, and 9 years teaching experience, Leslie decided to combine her passion for teaching with her passion for yoga and became a Registered Instructor. She believes implementing a regular stretching practice into athletic training will not only help with flexibility, but also endurance, breathing, balance, and mental and physical strength. When Leslie is not teaching flexibility classes you can find her at the pool, making memories with her kids, reading a good book, and enjoying all St. Louis has to offer (especially Cardinals baseball)! !